This blog post is by Brenda Ngosa, a child-sponsorship officer at Destiny Community School. It is always a great joy working in communities around Lusaka. It’s a life that most people will never have a chance to experience. The vulnerable people will always be glad to receive help that will improve their communities. Arise Africa’s line of work is helping different communities improve their well-being. Since 2010 we have worked on a number of projects that have been of great help to the communities. One of the communities Arise Africa works in is N’gombe, At our partnering school called Grace Christian Community School there has been a number of projects taking place to improve the livelihood of the children that go to this school and the community that they live in. Arise Africa started a feeding program a few months ago and it has been doing great, thanks to the help of our partners. A feeding structure has been built which means there are no worries when the rain season comes because feeding will continue and the children will not go hungry during lunch break. They will have their delicious meal and be able concentrate in class. That is not all the happenings with Africa Africa’s partnering schools and their communities. Lusaka has been hit with water problems. Grace community school was highly affected, but the problem is soon to be sorted out. Grace community school working with Arise Africa and other partners has contracted a drilling company to put in a well and a water tank. They came on site drilled about 50 meters going down and water could not be found. They drilled 60 meters in another place and still could not find water. The drilling company left and come back after a week only to find both holes had water to the top. It is a double blessing for Grace Christian Community School. When the pipes and the tank are installed, not only Grace community school will benefit but also the community at large. Destiny Community School is Arise Africa’s other Community School partnership. Recently the school put up a water tank of about 2500 liters for water storage. It happened that one day the whole community had no water for a day, and most of the people in the community flocked to Destiny Community School to get water. Some people had more than three buckets to fill. By the time the school realized that people were getting water from the tank, the water had completely drained. This tank is not on a well, but on city water. Once it was empty, there would not be any more water until the city fixed the problem with the water line. The good part about it is that the community did not go thirsty for that day. Finally, clean water supply is an educational exercise. The rainy season is rapidly approaching and it comes with lots of diseases; Cholera, Typhoid, Diarrhea, Malaria just to name a few. 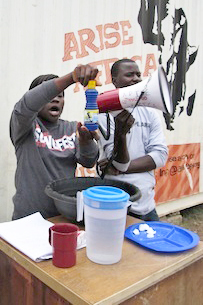 Arise Africa staff conducted a healthy campaign on prevention of Cholera. We talked about the causes and how it can be prevented, we did a skit and had a time for questions and answers. It was fun to share with the community. The good part is that the children learned something and they all were washing their hands with soap after using the toilet and before eating. Our hope after this exercise is that the children will go home and teach their family and friends about water safety and hygiene. In the end our prayer is that the community will be cholera free this rainy season.